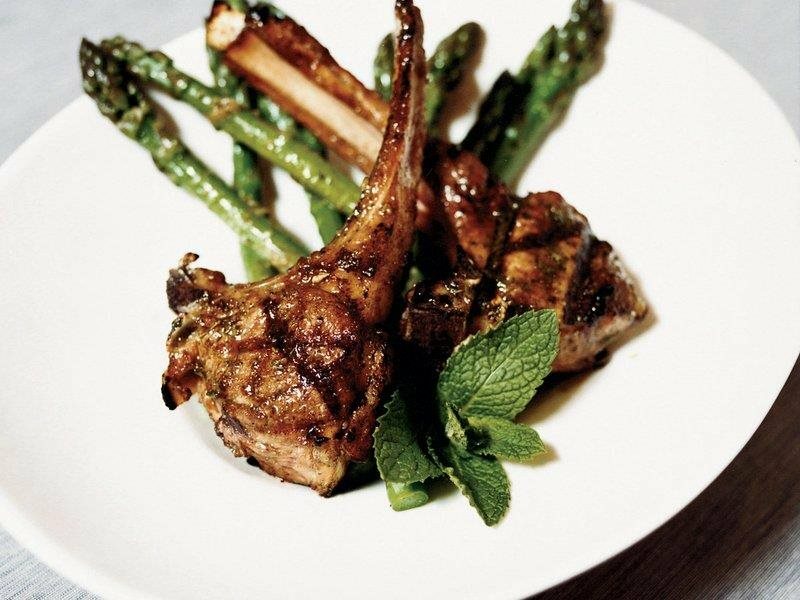 For the Grilled Lamb Chops: Combine in a saucepan ¼ cup of extra-virgin olive oil with the garlic and cook over moderate heat until golden, about 4 minutes, stirring frequently, Transfer the garlic oil to a blender. Add the rosemary, parsley, marjoram, salt, pepper, fennel, cumin, cardamom, vinegar and the remaining 3/4 cup of oil and puree until smooth. Arrange the lamb chops in a shallow baking dish. Pour the marinade on top of the lamb chops, turn to coat and refrigerate overnight. Return to room temperature before grilling. For the Herb and Spice Minted Asparagus: Heat in a small saucepan the olive oil. Add the garlic and shallot. Simmer over moderate heat until fragrant and softened, about 3 minutes. Transfer to a blender, add the lemon zest and let cool. Add the mint and a generous pinch of kosher salt and fresh ground black pepper. Puree the ingredients to a chunky paste. Cook the asparagus in a large skillet of boiling salted water until crisp-tender, about 4 minutes. Drain the asparagus and run under cold water to cool and pat dry. Transfer the asparagus to a platter and drizzle with the mint dressing.